You may schedule your lessons On-line 24/7. ​Lock your rate today! See below for details. 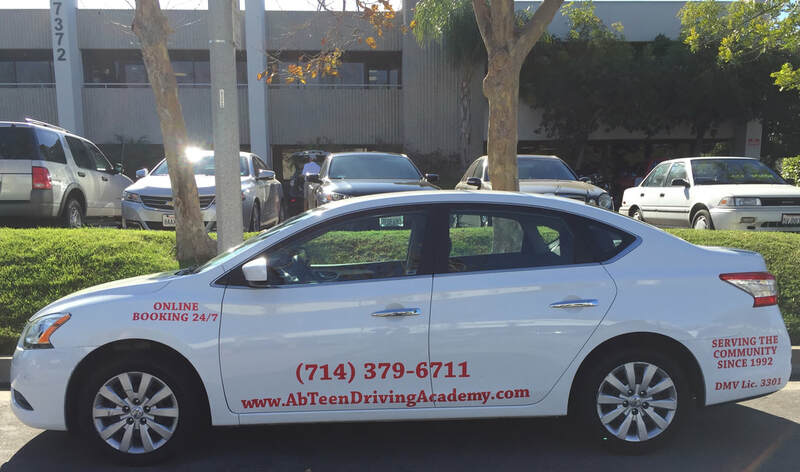 Why choose Ab Teen Driving Academy? We no longer offer driving packages. Now you may schedule your driving appointments on-line and pay as you go. Lessons offered six days a week. The 6 hrs required for a minor are split into three 2-hour lessons. Additional lessons may be purchased as needed. To schedule proceed to the bottom of the page. Ready to schedule? Proceed to the bottom of the page. Driver License Requirements for minors. Have held your instruction permit (in California or another state) for at least 6 months. Provide proof of completion of driver education and driver training (6 hours behind the wheel with a driving Instructor). Provide a parent(s) or guardian(s) and instructor(s) signature(s) on your instruction permit verifying that you have completed 50 hours of driving practice (10 hours must be night driving). Refer to the Parent-Teen Training Guide, available at any DMV office or online at www.dmv.ca.gov, for more information. Schedule a driving test online at www.dmv.ca.gov or by calling 1-800-777-0133 during normal business hours. If you fail, you must wait 2 weeks, not including the day the test was failed, before taking the driving test again and pay a retest fee for each subsequent driving test. NOTE: If you fail the drive test 3 times, you will be required to reapply and pay all applicable application fees. Drive between 11 p.m. and 5 a.m. NOTE: Local laws may further restrict or prohibit driving during specified hours. It is against the law for drivers under 18 years old to use a cellphone or other wireless electronic communication device while driving, including a hands-free device, unless making a call for emergency services or on private property. The law requires that you must carry a signed note explaining why you must drive and when the necessity will end. The note must be signed by your physician and include a diagnosis and probable date of recovery which will end your need to drive. The note must be signed by your school principal, dean, or designee, and include a reason for the school or school-authorized activity and probable date when the activity will end. The note must be signed by your employer, verify employment, and include the probable date your employment will end. The note must be signed by your parent or guardian, and include the reason and probable date the necessity will end. No documentation is needed for this exemption. However, when you applied for your instruction permit, you must have declared yourself emancipated by completing a Transmittal Form (DL 11) and providing a California Insurance Proof Certificate (SR 22/SR 1P) in lieu of your parent or guardian signatures. The driving test of a holder of an out-of-state DL is normally waived. However, DMV may require a driving test for any type of DL application. A minor who surrenders an out-of-state DL to apply for an original California DL, is subject to all restrictions/ requirements per California law. Proof of driver education and driver training may be required. You will be restricted for 30 days if you have a violation point count on your driver record of 2 or more points within 12 months. You will receive a 6-month suspension and 1-year probation if you have a violation point count on your driver record of 3 or more points within 12 months. NOTE: A provisional DL holder who receives additional violation points during their suspension/probationary period may receive a subsequent DL suspension. You must serve the full term of any probation, restriction, or suspension even if you turn 18 years old before the probation, restriction, or suspension ends. Next, on the calendar, select day and start time. Fill out the student's information. Next, a Thank you message will appear with a PayPal Buy Now at the bottom. Click on the PayPal Buy Now button. On the next page, you will have the option to use your PayPal account, or to pay with debit or credit card. Appointment will only be confirmed after the system has detected a completed payment. Parents with more than one child must enter one email PER student. Failure to do so will override the information of the previous one. If you bought the package with on-line driver Ed and a 2hr lesson, and would like to schedule your first driving appointment, please follow the instructions above, and indicate in the comments section that you have paid for the first 2hr lesson. ​Days and times Lessons are offered! Days and times Lessons are offered!